Mr. Steele -How About Getting the "Real Truth out "! Here's what it looks like when all the pieces are sewn together It smells like conspiracy and treason. Everyone needs to read this. Slowly, and patiently, because it’s very important...... From 2001 to 2005 there was an ongoing investigation into the Clinton Foundation. A Grand Jury had been impaneled. Governments from around the world had donated to the “Charity”. Yet, from 2001 to 2003 none of those “Donations” to the Clinton Foundation were declared. [ TAX EVASION] Now you would think that an honest investigator would be able to figure this out. Look who took over this investigation in 2005: None other than James Comey; Coincidence? Guess who was transferred into the Internal Revenue Service to run the Tax Exemption Branch of the IRS? None other than, Lois “Be on The Look Out” (BOLO) Lerner. Isn’t that interesting? But this is all just a series of strange coincidences, right? Guess who ran the Tax Division inside the Department of Injustice from 2001 to 2005? No other than the Assistant Attorney General of the United States, Rod Rosenstein. Guess who was the Director of the Federal Bureau of Investigation during this time frame? Another coincidence (just an anomaly in statistics and chances), but it was Robert Mueller. What do all four casting characters have in common? They all were briefed and/or were front-line investigators into the Clinton Foundation Investigation. Another coincidence, right? Fast forward to 2009.... James Comey leaves the Justice Department to go and cash-in at Lockheed Martin. Hillary Clinton is running the State Department, official government business, on her own personal email server. The Uranium One “issue” comes to the attention of the Hillary. Like all good public servants do, supposedly looking out for America’s best interest, she decides to support the decision and approve the sale of 20% of US Uranium to no other than, the Russians. Now you would think that this is a fairly straight up deal, except it wasn’t, America got absolutely nothing out of it. However, prior to the sales approval, no other than Bill Clinton goes to Moscow, gets paid 500K for a one hour speech; then meets with Vladimir Putin at his home for a few hours. Ok, no big deal right? Well, not so fast, the FBI had a mole inside the money laundering and bribery scheme. Robert Mueller was the FBI Director during this time frame? Yep, He even delivered a Uranium Sample to Moscow in 2009. Who was handling that case within the Justice Department out of the US Attorney’s Office in Maryland? None other than, Rod Rosenstein. And what happened to the informant? The Department of Justice placed a GAG order on him and threatened to lock him up if he spoke out about it. How does 20% of the most strategic asset of the United States of America end up in Russian hands when the FBI has an informant, a mole providing inside information to the FBI on the criminal enterprise? Very soon after; the sale was approved! ~145 million dollars in “donations” made their way into the Clinton Foundation from entities directly connected to the Uranium One deal. Guess who was still at the Internal Revenue Service working the Charitable Division? None other than, - Lois Lerner. Ok, that’s all just another series of coincidences, nothing to see here, right? Let’s fast forward to 2015. Due to a series of tragic events in Benghazi and after the 9 “investigations” the House, Senate and at State Department, Trey Gowdy who was running the 10th investigation as Chairman of the Select Committee on Benghazi discovers that the Hillary ran the State Department on an unclassified, unauthorized, outlaw personal email server. He also discovered that none of those emails had been turned over when she departed her “Public Service” as Secretary of State which was required by law. He also discovered that there was Top Secret information contained within her personally archived email. Sparing you the State Departments cover up, the nostrums they floated, the delay tactics that were employed and the outright lies that were spewed forth from the necks of the Kerry State Department, we shall leave it with this…… they did everything humanly possible to cover for Hillary. Now this is amazing, guess who became FBI Director in 2013? None other than James Comey; who secured 17 no bid contracts for his employer (Lockheed Martin) with the State Department and was rewarded with a six million dollar thank you present when he departed his employer? Amazing how all those no-bids just went right through at State, huh? Now he is the FBI Director in charge of the “Clinton Email Investigation” after of course his FBI Investigates the Lois Lerner “Matter” at the Internal Revenue Service and he exonerates her. Nope.... couldn’t find any crimes there. In April 2016, James Comey drafts an exoneration letter of Hillary Rodham Clinton, meanwhile the DOJ is handing out immunity deals like candy. They didn’t even convene a Grand Jury. It's scary the connections you can find between these players. Diana Wow old Comey really goes back a ways doesn't he? 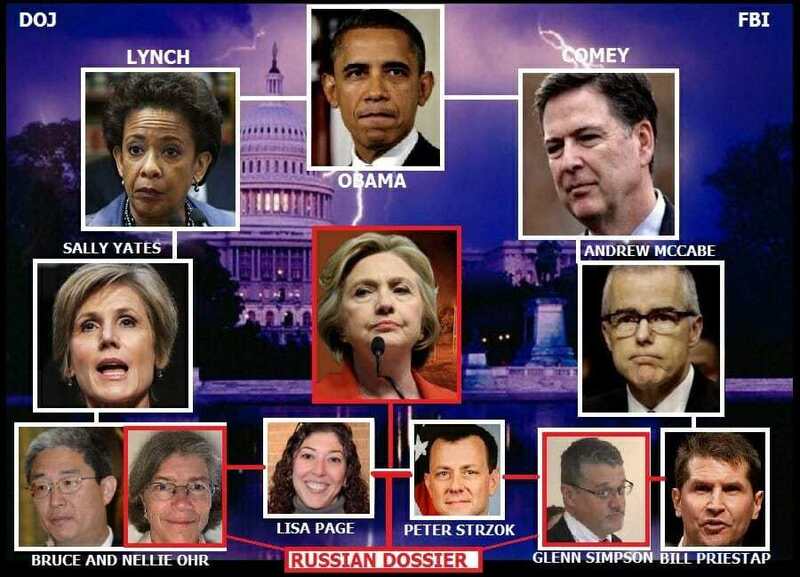 The media intentionally refuses to connect the dots and expose the string of liars and traitors! Who was Deputy Special Council on the Whitewater Committee who could find no "intent" on the part of HRC after drawing up a draft indictment against her? What for it...James Comey. Partners in crime a long time.